Once nicknamed the Borscht Belt, the Catskill Mountains are undergoing a transformation from a summer resort spot to a year-round residential area. As a result the region, with it's diverse population is witnessing an economic rebound. 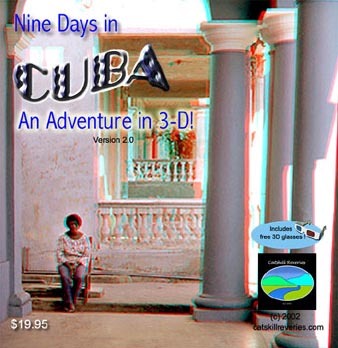 This CD-ROM takes you to this beautiful, heavenly environment where you'll visit the villages, farms, and the people that are such a unique slice of Americana. This, the revised Version 2.0 provides many visual enhancements over Version 1.0. Utilizing the FlipAlbum (R) concept, pictures and text appear in a "book" containing pages that realistically flip like a real volume. As in a true book, a Table of Contents, an Index, and even thumbnails of each stereoscopic image is included. Unlike the first release, pages bend and cast shadows as they are turned! Also, some of the pictures have been enlarged to two-page spreads for dramatic impact. You'll get an intimate peek at Cuban society and everyday life, exploring factories, schools, hospitals, and even the elegant National Cemetery. This CD-ROM is ABSOLUTELY FREE with the purchase of both the "Sullivan-Ulster" and "Cuba" CDs. This colorful software contains twenty 3-D views, with each scene beautifully framed. Special 3-D glasses are included. Item may be purchased separately for $9.95 plus shipping. Shipping: $3.95 per CD. If both "Sullivan and Ulster Counties" and "Nine Days in Cuba" are ordered, you will receive the "Sullivan County, NY" CD free with no additional shipping charge. Insurance is optional (an additional $1.70, if desired). Payment can be made by PayPal (click on the PayPal button). If you don't already have an account, sign up for a free one. It's easy and takes only a few minutes.